Tony Robbins has done some great work with NLP and provides awesome insights on how understand our thoughts and behaviors. 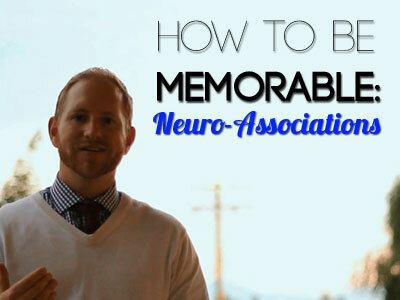 Observing and understanding neuro-associations is a great first step. Our brains are amazing systems that we don’t fully understand, but there are definitely ways that you can use your knowledge of it to your advantage. I love studying human psychology, especially for helping me build better sales and marketing tools and processes. By knowing how we are hard-wired to receive and send information, we can create stronger rapport, deeper relationships, and faster connections. And it’s not about using tricks or manipulation. I try and use my powers for good (mostly). When someone asks you how you are doing, how do you normally respond? And how often do you respond each way? What do you feel if you heard someone else say those words? What thoughts pop into your head? Well the thoughts and emotions that link to the situation are what we call neuro-associations. Neuro-associations are the links between thoughts and emotions in your mind, which create and shape your behavior and performance results. There are countless ways our mind operates on a subconscious level without any intervention from us. We can’t necessarily control how we feel or think when situations are in front of us. Our brain takes shortcuts and tries to piece things together for us. So how do you use this to your advantage? Before you are about to see someone, take a few seconds and mentally prepare to wow them with your energy, your presence, and your focus on them. Set intentions to make sure you are in that ready state. When you walk in a room and meet people for the first time, what would you like them to associate seeing you with? Success? Cockiness? Disorganized? Happy? Did you ever see that Seinfeld episode where George decided he would always leave on a high note? Well, he was using the power of neuro-associations. George made a plan that every time he told a joke that made people laugh, he would make that his cue to leave and would say, “That’s it for me!” So what is the last thing that people remember from your interaction with them? I will also be writing about the “recency effect” later this week which is a very useful tip to follow for salespeople and is all about being the last person to be in front of the client for increasing your odds of winning the sale. What will you be remembered for, if anything at all? This is probably the most important of all three tips. When you see people, take a lesson from dogs. Let others know that you are absolutely happy to see them. Greet people with a warm smile, an enthusiastic handshake, and an open heart. They will feel your energy and always be looking forward to seeing you again. I see too often that in our relationships, we don’t make the other person feel special because we get comfortable with having them around. When you see those you care about, put a massive smile on your face, give them a hug and really mean it when you say, “So glad to see you.” Also, we are all feeling a bit insecure at times, so what do you think a warm greeting does to the other person? You never know the impact you have on those around you. What do you want to be known for? If this is not normal behavior for you now, then make it your purpose this week to change that behavior. Try it every day for the next five days and you will be shocked at the dramatic difference you will see in those around you. Make your comments below about how this actually helped you out. Share this post with your friends and challenge them to do the same. Come back here and share your stories on how we made a difference this week! This week, I will be diving into more mind control, psychology, sciency-stuff, so make sure you are on the list to receive the updates! I will be discussing the The Science of Influence: How to Get Anyone to Say “Yes” in 8 Minutes or Less! by Kevin Hogan which is one of my favorite reads. And over the next while I will also be digging deeper into neuro-associations to help you gain even more of an edge with your brain.